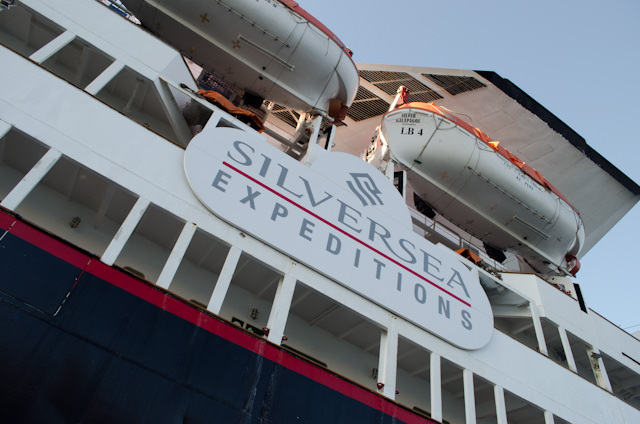 In September of 2013, ultra-luxury line Silversea took delivery of a second vessel for its Silversea Expeditions arm. In her past life, she was one of the most lauded luxury ships. 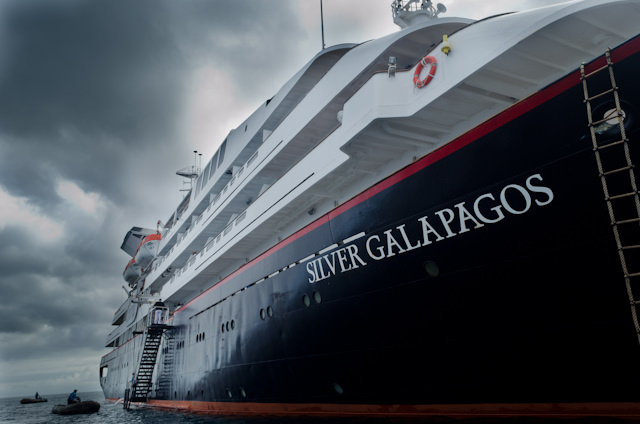 Now, thanks to a series of substantial refits performed in 2013 and 2014, Silversea’s Silver Galapagos is well on her way to reclaiming that lofty title. 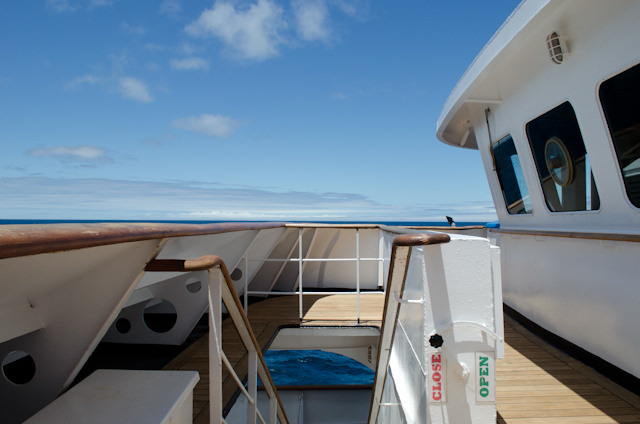 Sailing year-round in the Galapagos, Silver Galapagos began life as Renaissance Cruises’ Renaissance Three. 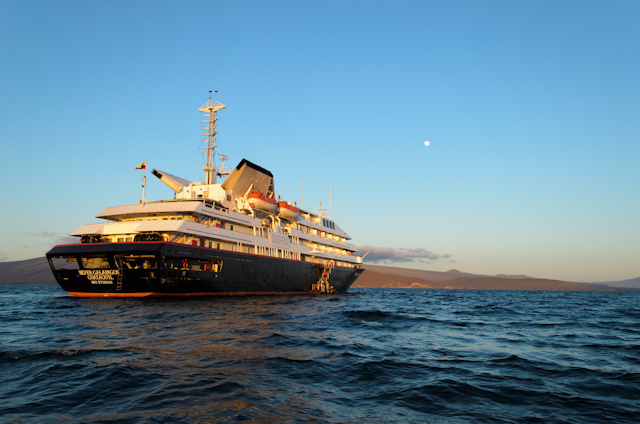 Launched in 1990, the diminutive luxury ship would remain in the fleet until 1998, when she was sold to Canodros S.A. for service sailing around the Galapagos Islands. 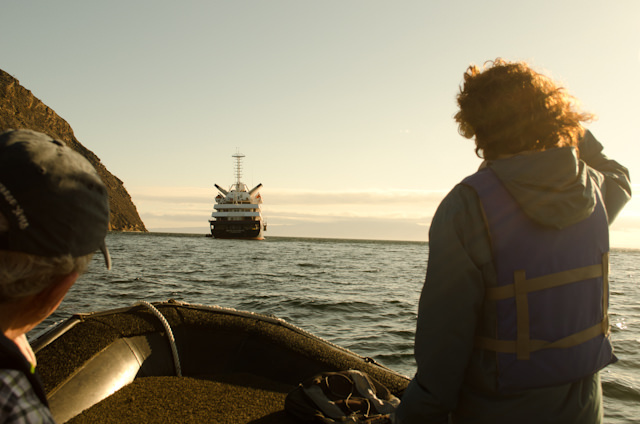 As Silversea discovered during the first year of operations, sailing in the Galapagos is no cakewalk. There are unique restrictions placed on everything from the crew of the ship right down to the kinds of toiletries you can bring onboard. Nearly everything onboard must be sourced from the Galapagos Islands or Ecuador. Failing that, the only other possibilities are other South American countries like Argentina or Brazil. In other words – don’t expect to have your favorite French champagne onboard; it won’t be there. 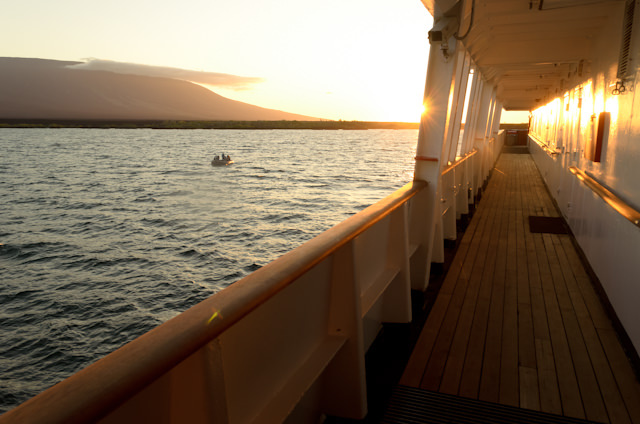 Nearly everything onboard must be sourced from the Galapagos Islands or Ecuador. Failing that, the only other possibilities are other South American countries like Argentina or Brazil. In other words – don’t expect to have your favorite French champagne onboard; it won’t be there. Every cruise line operating in the Galapagos must play within the same sandbox, and Silversea is no exception. What the line does better than anyone else in the region is to push the envelope and offer more amenities, features and open deck space than its competitors. Ultra-luxury voyages to the Galapagos just don’t exist, and Silversea is literally creating an entire market where there previously was none. There have been growing pains, yes. But the stunning beauty of the Galapagos Islands is now complemented by the Silver Galapagos; a ship that now looks better than she has at any point in time in the last decade. Better still, Silversea is just getting started. Let’s take a look at the Silver Galapagos as she appeared in October 2014. 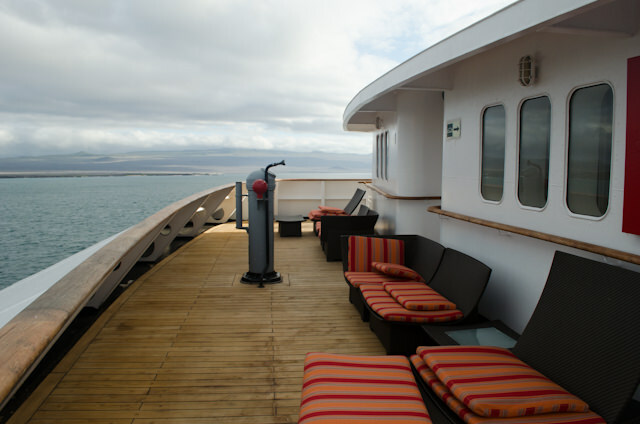 This is the lowest passenger-accessible deck onboard Silver Galapagos. 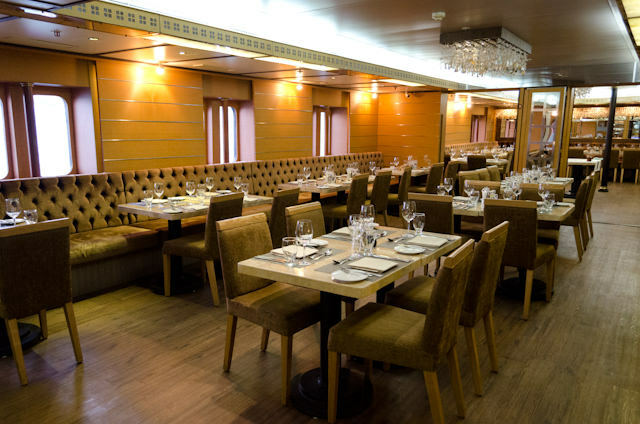 It houses the ship’s main Restaurant, which is open for breakfast, lunch and dinner – though, on my sailing, it was only truly used for breakfast and lunch, with most guests preferring to lunch topside at The Grill on Deck 5. 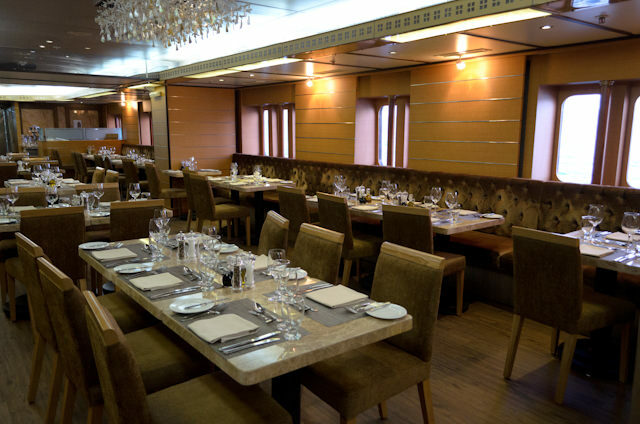 Unlike most shipboard dining rooms, The Restaurant aboard Silver Galapagos does not span the full width of the ship. 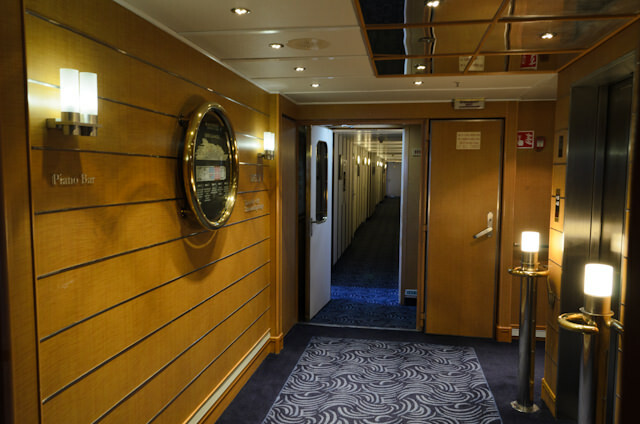 Instead, it occupies a small corridor of space running along the port side of the vessel. Large picture windows, split into three separate panes, let ample light into the room, though the décor composed of brown-on-brown-on-brown can be a little hard on the eyes. Still, this is a room that looks far better in person than it does in photographs, and by night it is exactly what a good dining room should be: warm, intimate and inviting. Food served here is mainly Ecuadorian-style cuisine with North American and European touches. You can expect to see traditional Ecuadorian seafood soup grace the menu at least one night, and even Ostrich is served on occasion. Be sure to try both; they’re delicious. 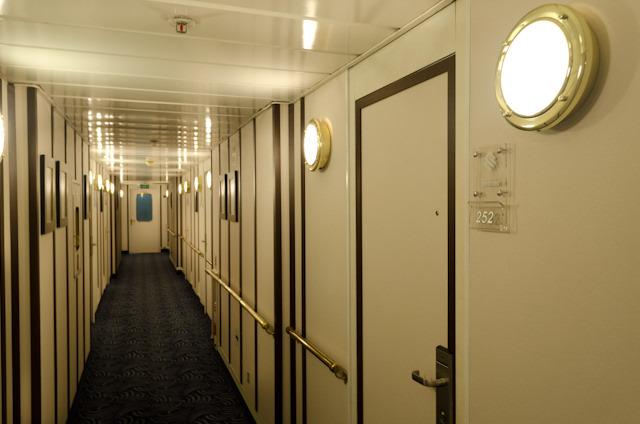 The remainder of Deck 2 is taken up with seven Explorer Suites, all of which feature three porthole windows each and measure from 210 square feet to 240 square feet, depending on configuration. 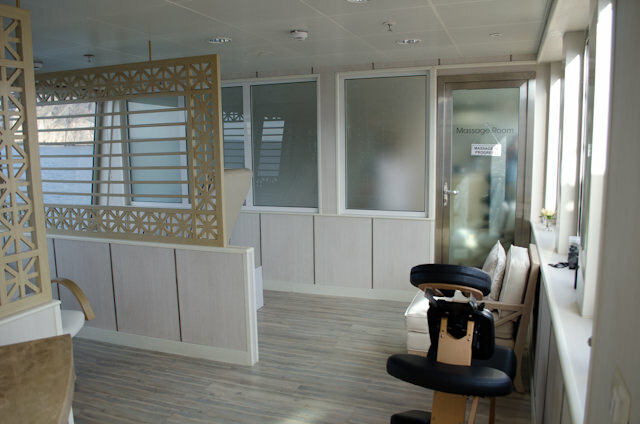 The main embarkation deck, Deck 3 is home to the Reception Desk aboard Silver Galapagos. Here, you can have the usual shipboard queries answered, set up your onboard account, and pay your final invoice – if any. 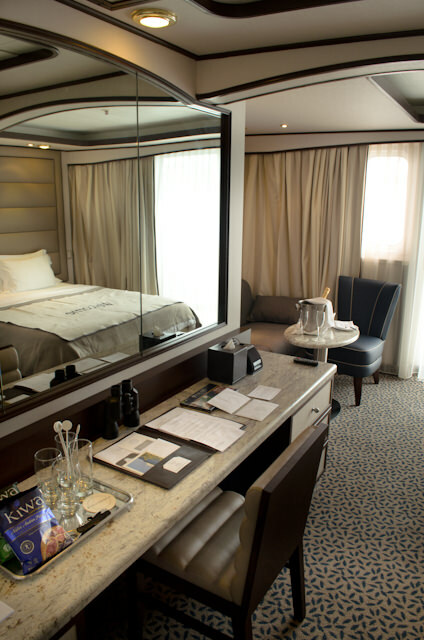 Nearly everything onboard Silversea’s expedition vessels is included in the cost of the cruise. 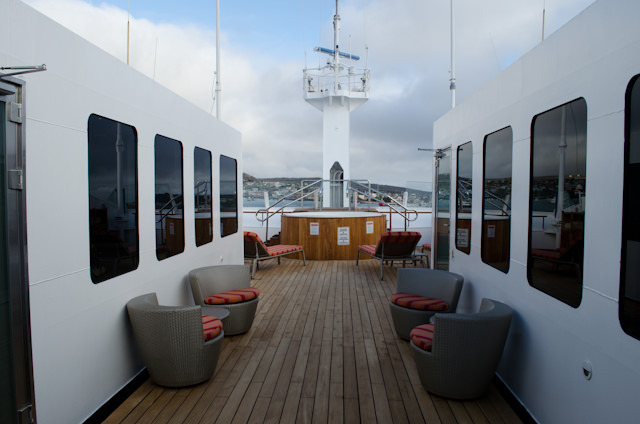 Just outside the main Reception area is a classic teak Promenade Deck. 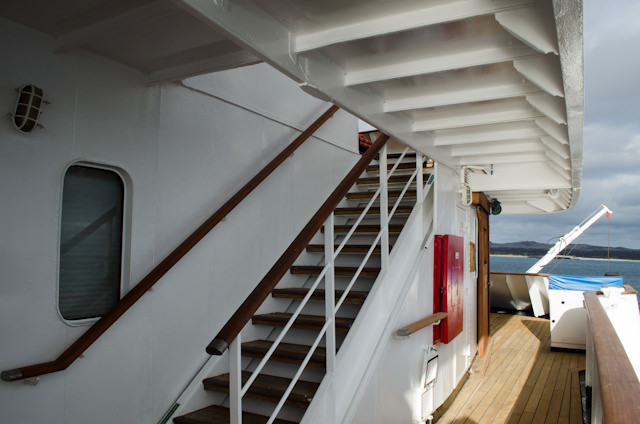 It’s mainly a utilitarian space, but it’s still accessible to passengers at all but the most extreme point of the bow, where the ship’s Zodiac Rafts are stored. At the stern, wet suits are stored for snorkelling purposes. Just aft of the Reception Lobby is one of the most well-stocked expedition libraries I’ve seen. 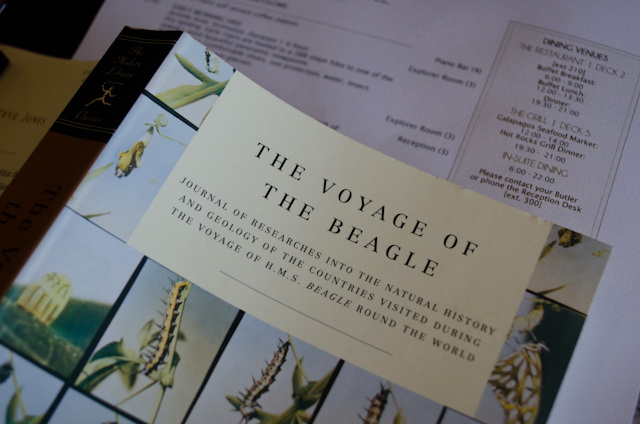 Nearly every title you could hope for on the history of the Galapagos, Ecuador, Charles Darwin, his Theory of Evolution, and more is included here. In addition, the daily news from the news wires is available in localized and International editions, along with the daily Silversea Quiz and Silversea Challenge puzzles. The lounge as it appeared prior to September 2014. 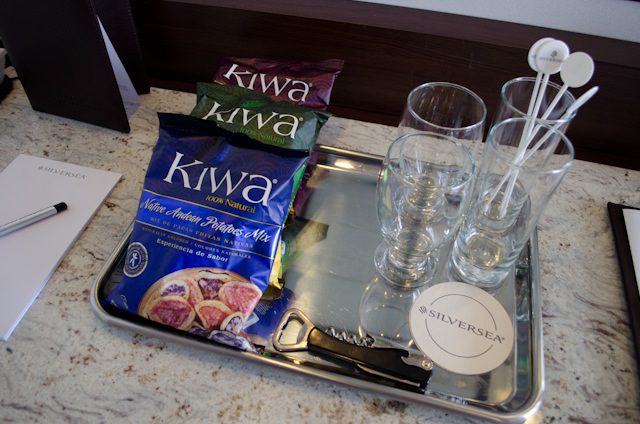 Photo courtesy of Silversea. 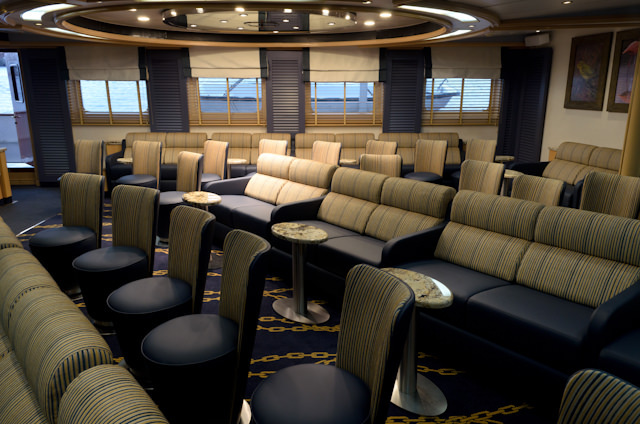 All the way at the stern on Deck 3 is the main lecture hall and briefing room aboard the Silver Galapagos. 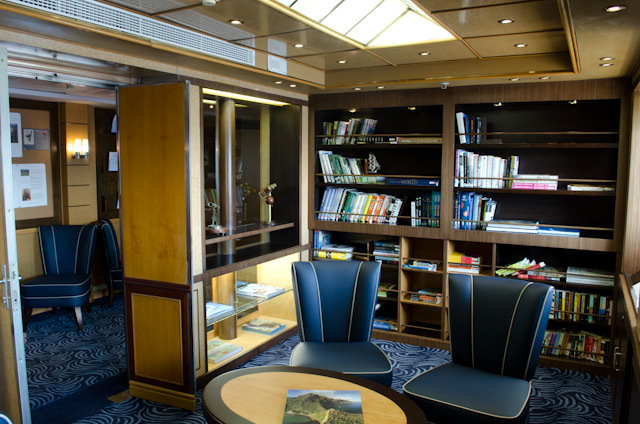 Known as the Explorer’s Room, or Explorer’s Lounge, this room was given a complete top-to-bottom refit during the ship’s September 2014 drydock. Guests will see a lot of this room during their cruises around the Galapagos Islands; it is from this room that nearly all expeditions ashore meet and leave from, and here that lectures are presented during the afternoons and daily recaps and briefings are given just before dinner. 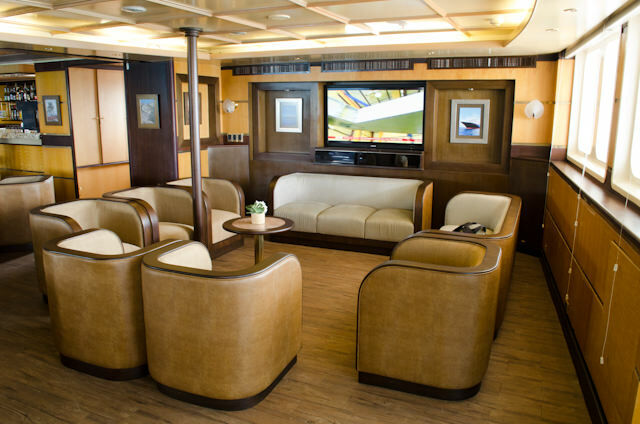 Its color scheme and décor are similar to that featured aboard the line’s third luxury expedition vessel, Silver Discoverer. 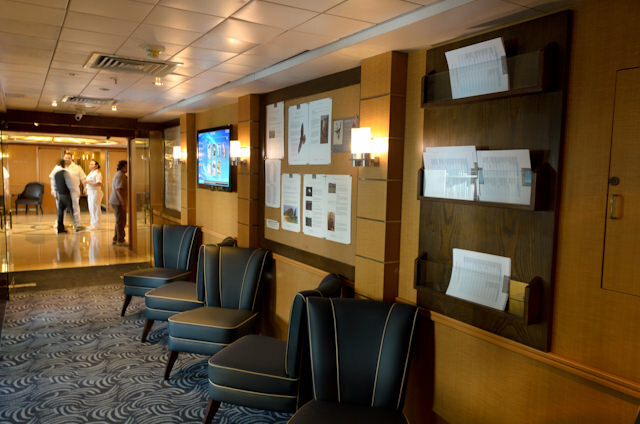 The remainder of Deck 3 forward of the Reception Lobby is occupied by 12 Explorer Suites. 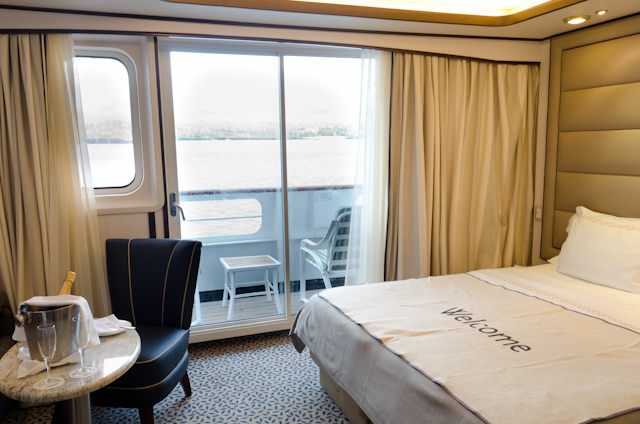 Unlike their Deck 2 counterparts, these suites feature picture windows divided into three separate panes and are slightly larger, at 235 square feet to 250 square feet. 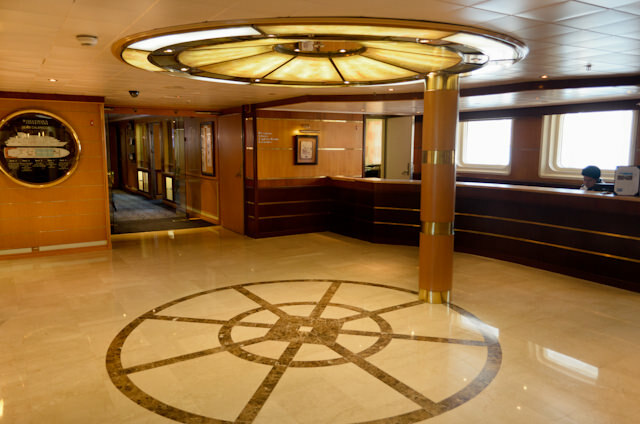 Deck 4 has just one public room, situated all the way aft. 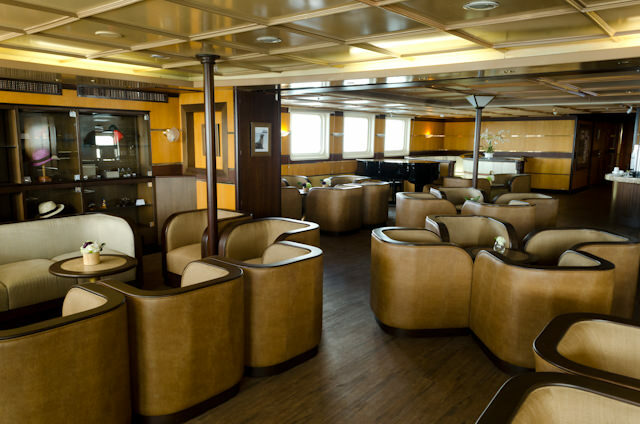 The Piano Bar is the go-to spot aboard Silver Galapagos for a pre-dinner cocktail or an evening nightcap before turning in. Recently redone, it features several cozy seating areas that are perfectly sized for couples or large groups thanks to a variety of different seating options. By day, the room is bright and inviting thanks to large picture windows placed on three walls of the room. 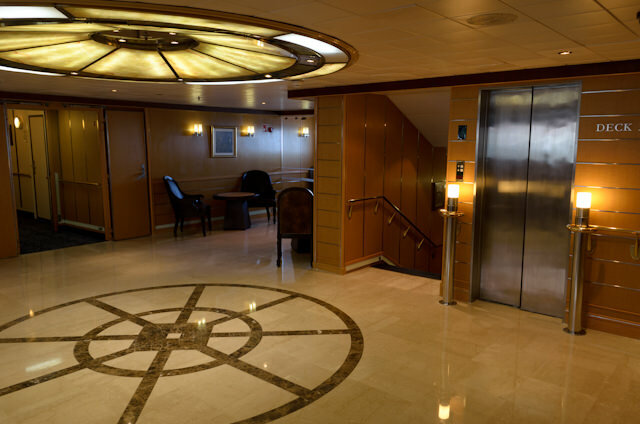 Access to the Explorer’s Room is provided via a spiral staircase located on the forward port-side of the lounge. This also doubles as a lighting source in its own right, thanks to backlit panels on the wall of the staircase that illuminate the entire forward section of the room. By night, the Piano Bar can seem a little dim in some sections due to the odd arrangement of overhead lighting, but this isn’t an issue – you only need to be able to hear the live piano music performed nightly to fully enjoy your drink. 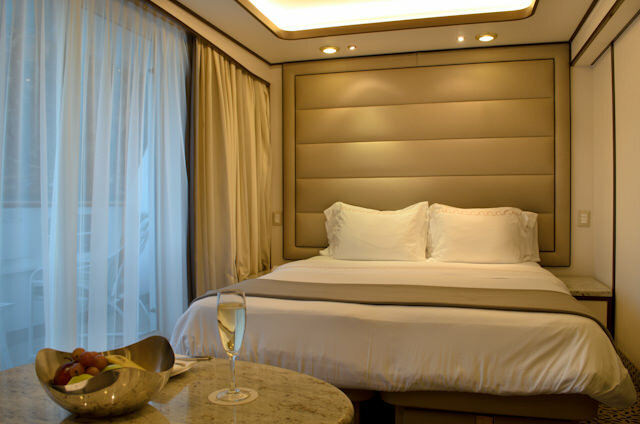 Deck 4 boasts eight Deluxe Veranda Suites. These are all mostly 268 square feet, though some rooms feature slightly different configurations. For example, Suites 427 (pictured), 426, 425 and 424 all feature a separate sitting area with a couch, chair and table situated next to the balcony and directly across from the bed. 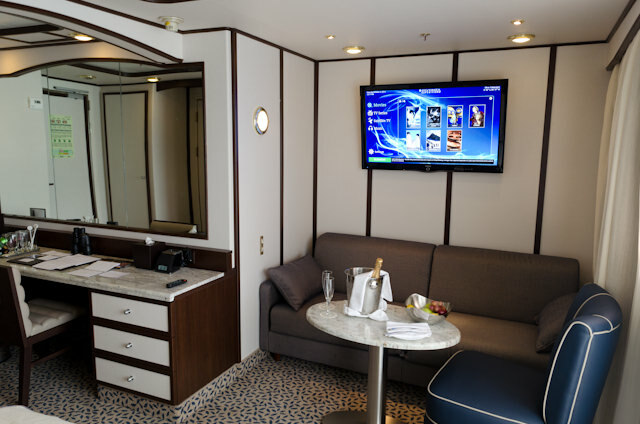 Suites 423 and 422 feature this sitting area immediately adjacent to the stateroom door, while the bed still occupies the space opposite the balcony door. All rooms feature a variety of closet and shelf space, along with a brand-new desk and vanity area, new furnishings, wall treatments, accents and enhanced lighting. 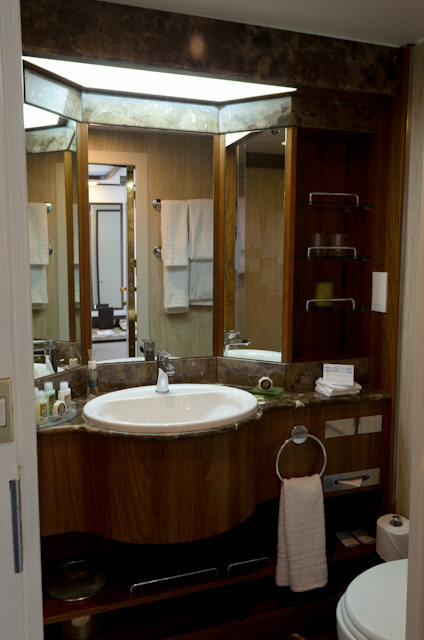 Like the rest of the suites aboard Silver Galapagos, these rooms feature Silver Spirit-esque marble bathrooms. Butler Service is common throughout all suites, and In-Suite Breakfast can be enjoyed between 6 a.m. and 10 a.m. by filling out the card the night before and attaching it to the outside of your stateroom door before 11 p.m.
Deck 4 also has five Explorer Suites and a handful of crew staterooms used by the Expedition Team. 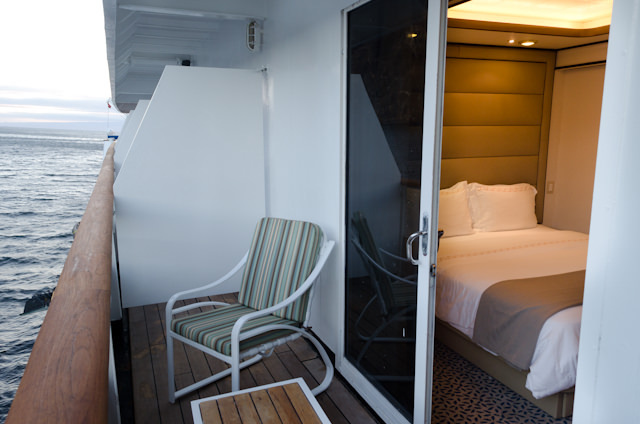 Aside from 12 Veranda Suites and two special 287-square foot Terrace Suites, there is only one public room on Deck 5 – but it’s a popular one. 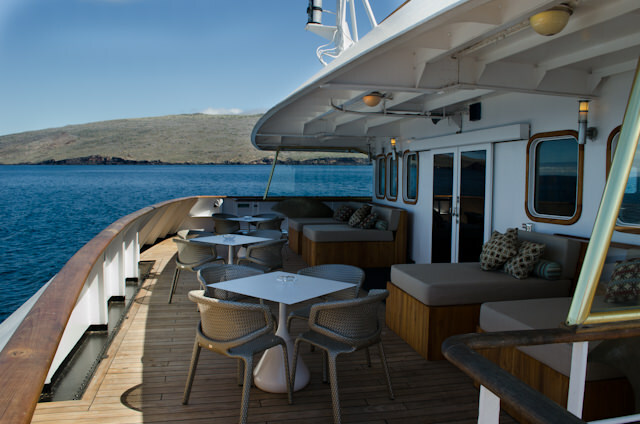 You’ll find Silversea’s popular Grill Featuring Hot Rock Dining on Silver Galapagos, and lunches here are positively packed. The Grill is the place to be each day, with lunch typically running from noon to 2 p.m. Different specials are on offer each day, in addition to an extensive buffet of soups, cold cuts and salads – not to mention some mouth-watering deserts. 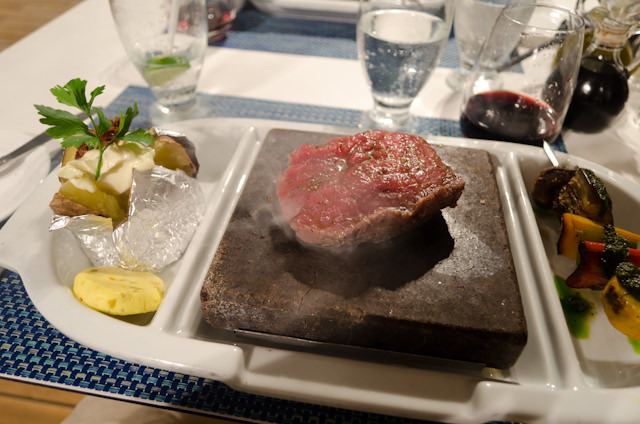 At night, The Grill features “cook-it-yourself” hot rock dining where a variety of meats and seafood can be grilled upon your very own slab of hot volcanic rock. This is paired with vegetables and a baked potato with all the trimmings, and comes with a choice of three salads as a starter and a selection of desserts (get the Apple Pie – it’s still fabulous). While dining here is free, you’ll want to make reservations – only a handful of tables are set each evening to ensure that service is prompt and personable. 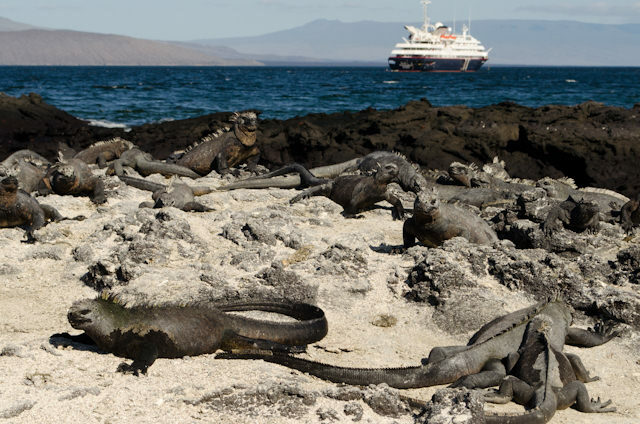 In the Galapagos in particular, this is a must-do experience when onboard Silver Galapagos. 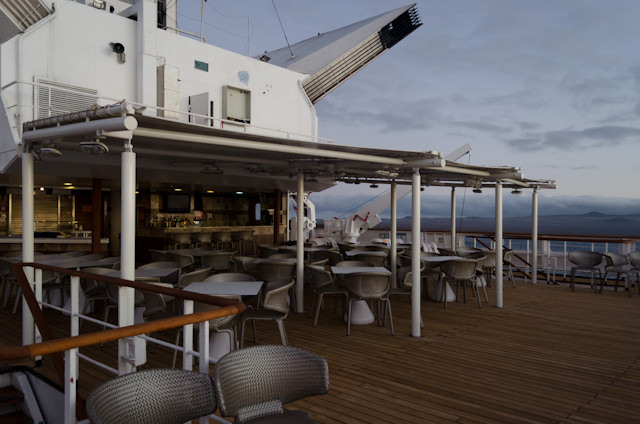 Before acquisition by Silversea, Deck 6 was a sort of no-man’s land that contained only a motley assortment of deck chairs and loungers for sunbathing. 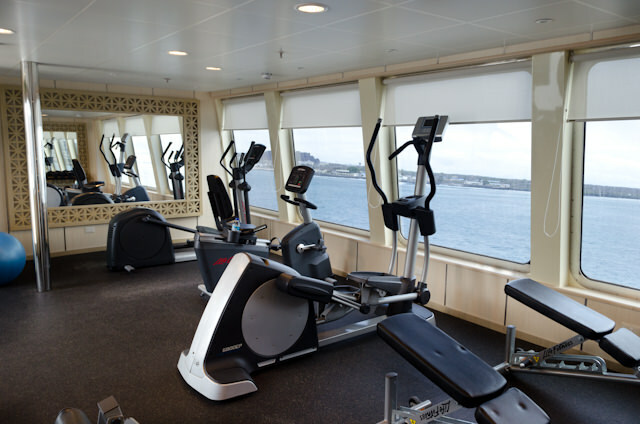 That all changed: Deck 6 now sports a small but fully functional Spa at Silversea, along with a surprisingly well-equipped Fitness Center. A Hot Tub, mounted all the way forward on the centerline of the ship, is well-used during the day and remains open for part of the evening. 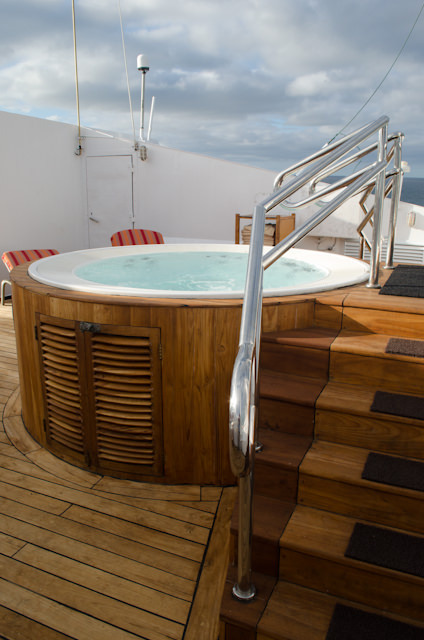 Because of its location high atop the ship, the views from the upper portion of the hot tub as you get in are superb. If you look hard enough, you can find some amazing hidden open deck spaces at the forward ends of Decks 4 and 5, and at the aft of Deck 4. 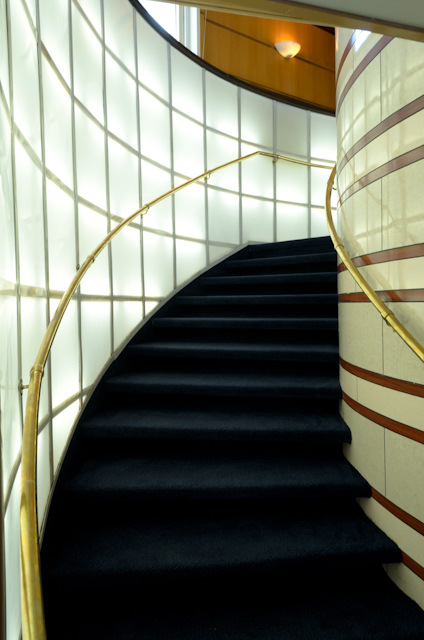 These can all be accessed from the interior corridors of the ship on each respective deck, or via a set of stairs located at the forward end of the open promenade on Deck 3. 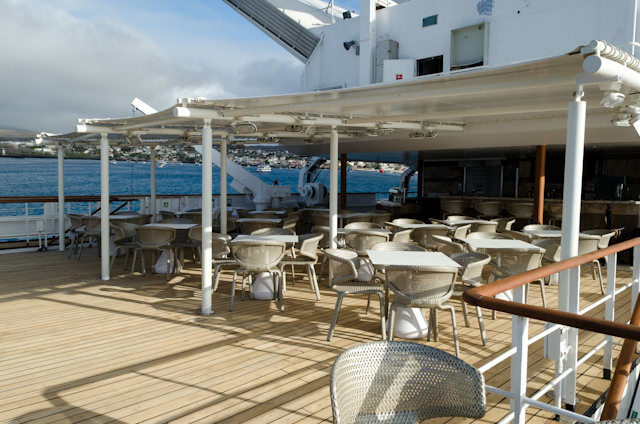 Thanks to a full-blown refit that has removed nearly all traces of her former dark, wood-paneled Renaissance-era interior décor, Silver Galapagos now appears fresh and modern. Her lighter interiors and public rooms work well in the seemingly endless sunlight that is graced upon the Galapagos Islands, and her physical size allows her to ride out the surprisingly large swells in the area with a minimal amount of discomfort. 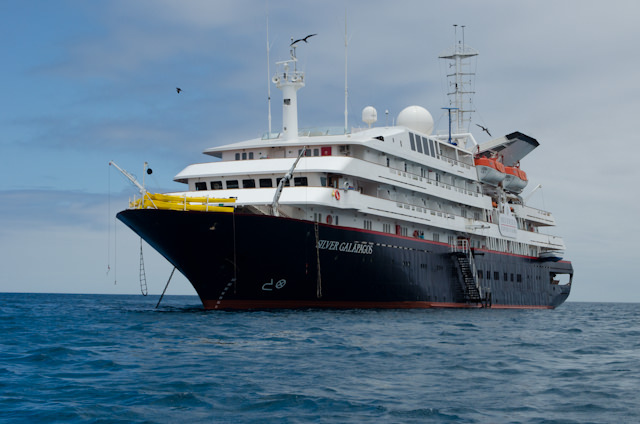 She’s one of only a few vessels in the region to carry 100 guests, and stands out as being one of the largest and most amenity-laden ships to sail the Galapagos Islands. The Galapagos is a stunning, bucket-list, once-in-a-lifetime destination. You’ll enjoy it on any ship. 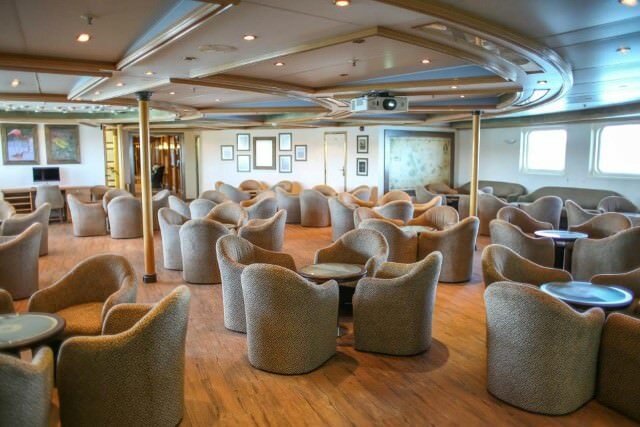 But chances are good that, after her recent refit and refurbishment, you’ll enjoy it a whole lot more aboard Silver Galapagos. Click here to read our full, day-by-day, Live Voyage Report from Silversea’s Silver Galapagos during our October sailing in the Western Galapagos.